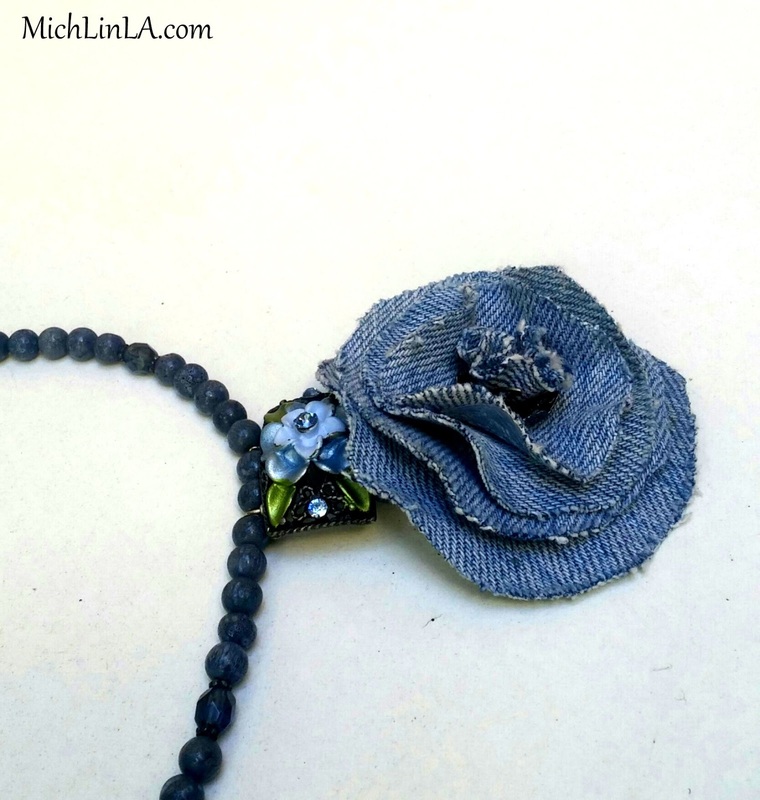 Mich L. in L.A.: No-Sew Recycled Denim Pendants - With A Hidden Metal Underwire! No-Sew Recycled Denim Pendants - With A Hidden Metal Underwire! Hello, my friends! Today I have a fun and flowery upcycled jewelry idea to show you. 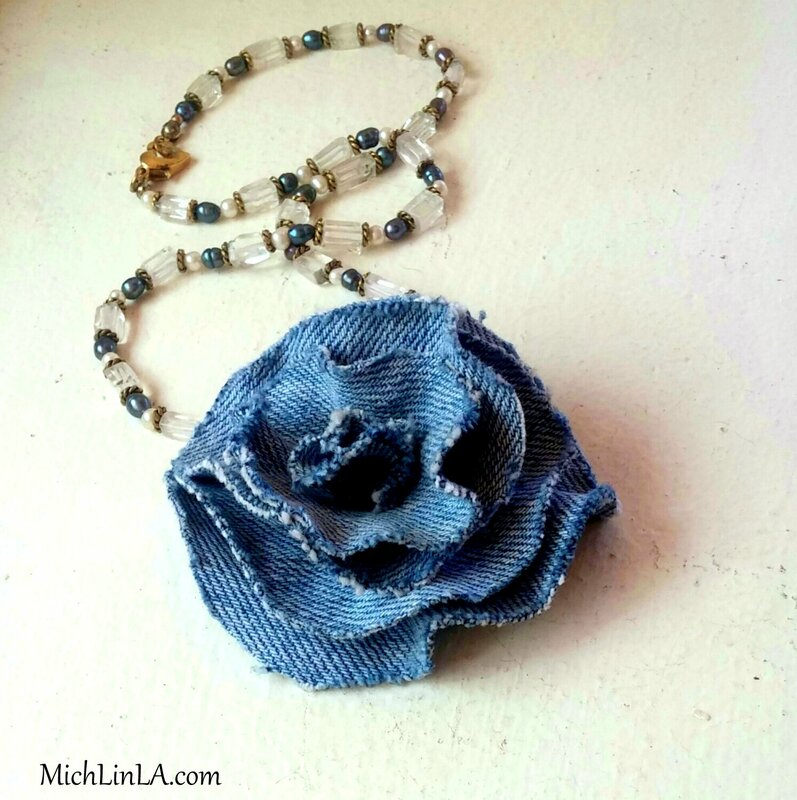 Denim rose pendants! 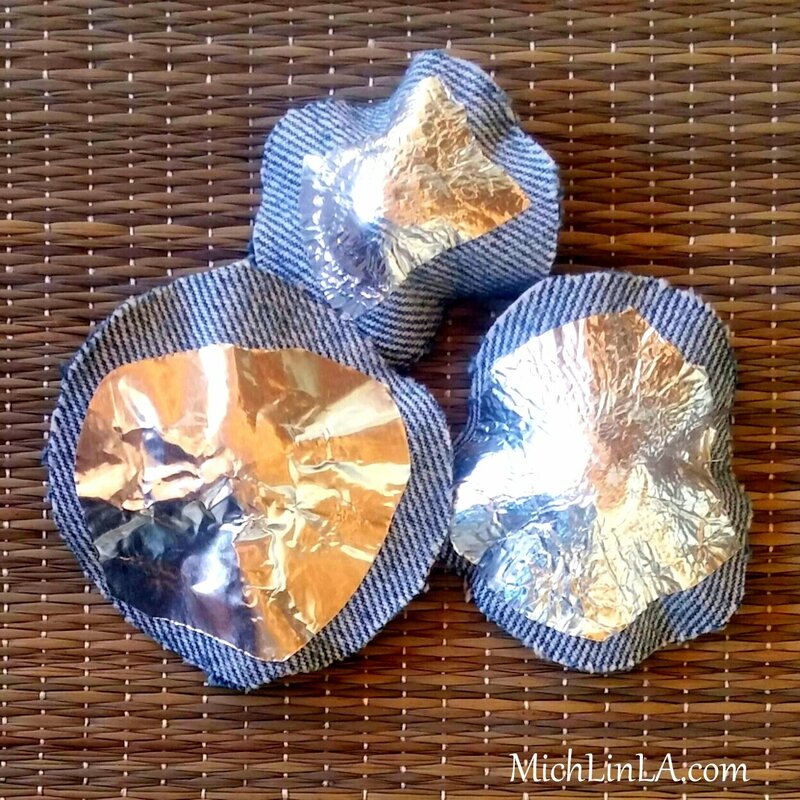 The unique thing about these roses: a secret metal structure underneath, that keeps the petals from drooping. Just like an underwire bra! Not that any of us know anything about underwire bras...no, no. No droopy petals here. We are all naturally perky. But I digress. My rose has four graduated circles as the main petals. 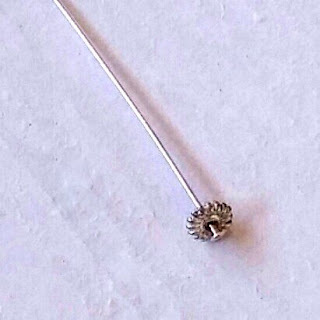 There are two hidden metal components to the structure. Ready to learn the secret? OK! Support secret number one: the largest petal has an actual underwire. 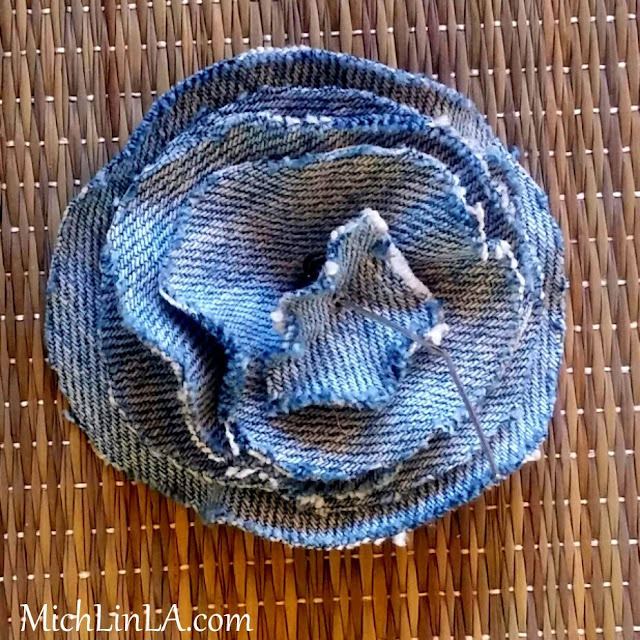 To make it: referring to the photo above, poke four holes in your largest circle. 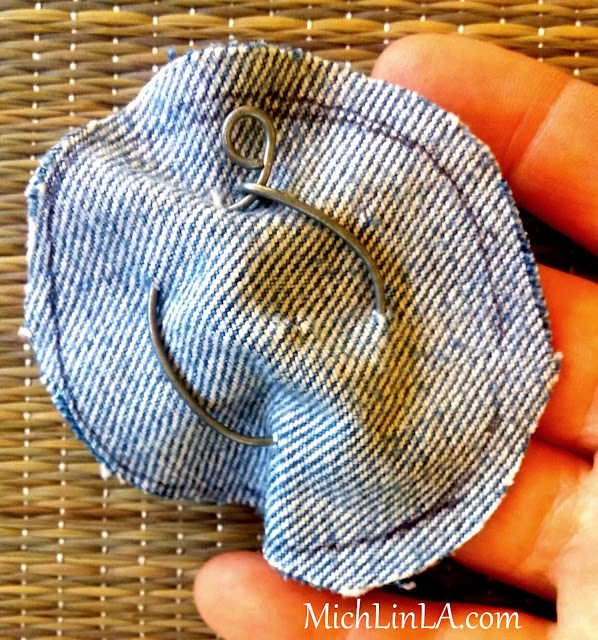 Thread craft wire through the holes. 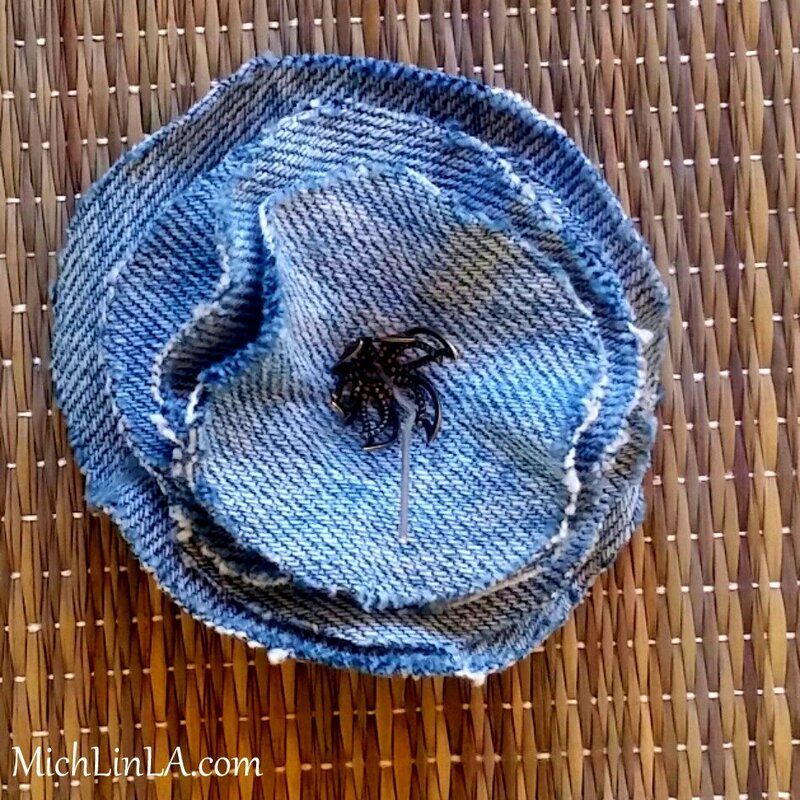 Form a loop so the denim is slightly gathered. Pinch one end of the wire tight to secure. On the other wire end, make a small loop. Support secret number two: stiffen the three smallest circles with my favorite stuff - aluminum duct tape. Add a piece of tape to the back of each denim petal, then pinch them up in the center. 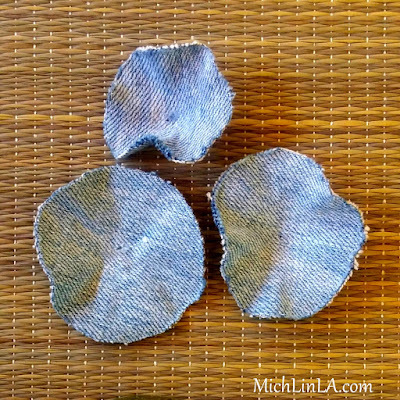 Flip them over and they now have subtle ruffles! See? To assemble the rose, first put a small flat spacer on a headpin. 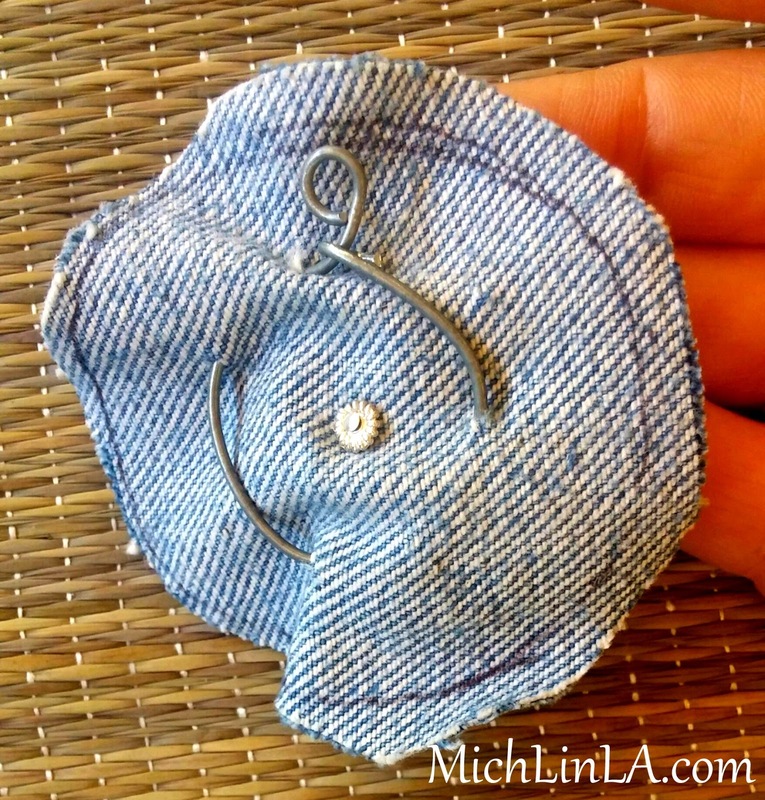 Poke a hole in each petal and stack them onto the headpin. Add a bead cap. Add a scrap of denim, which will be the tiniest center petal. 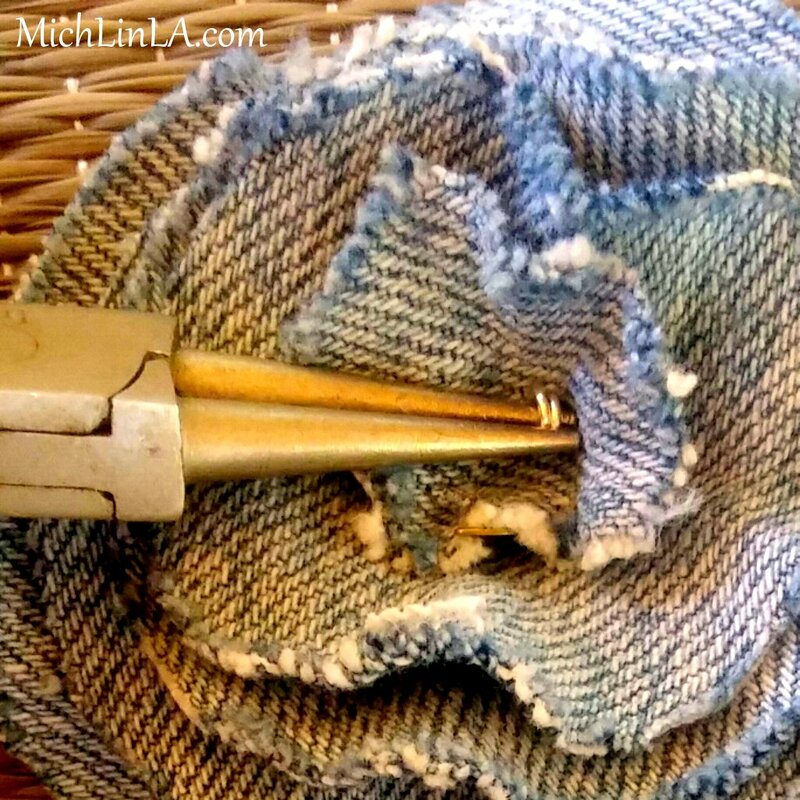 Trim the headpin short. 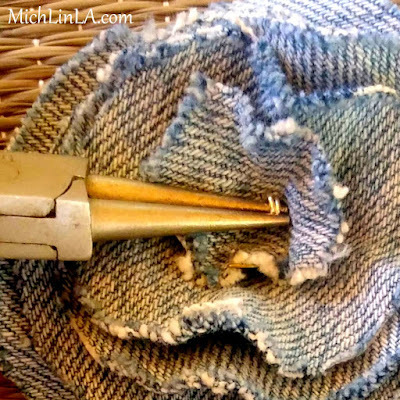 Use round-nose pliers to twirl the wire down into the center. Twist it as tight as it will go! And huzzah, that is your finished underwired rose. Use that small wire loop as a built-in bail, to hang your pendant from a strung necklace. 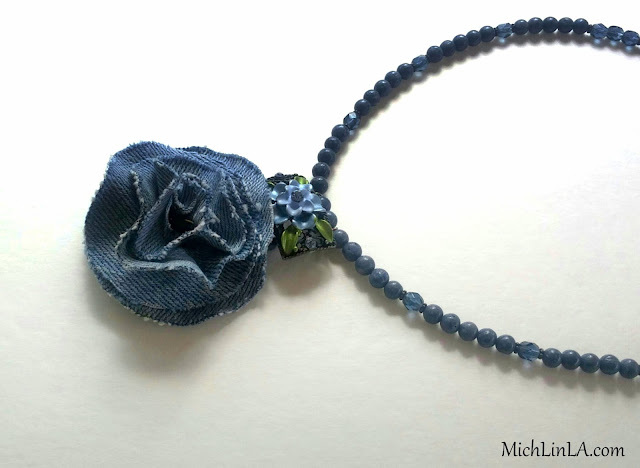 My concept was to contrast the rustic denim pendants with elegant semiprecious stones. These are strung with natural quartz crystals, Czech crystals, lapis beads and freshwater pearls. They look amazing dressed up or dressed down. 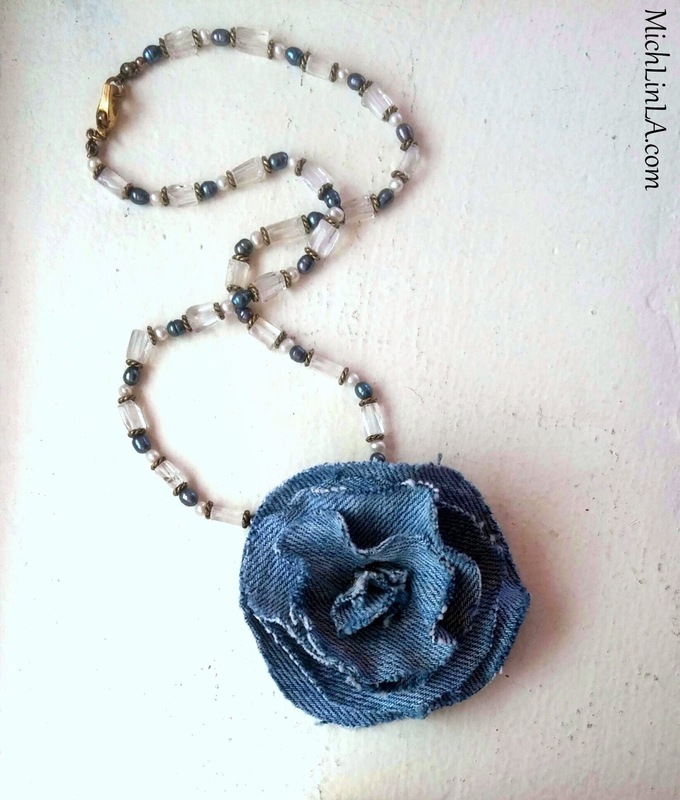 Aw, go on, you know you want to make one...and wear it like the natural-born Blue Jean Queen that you are. This just the cutest creation!!!! 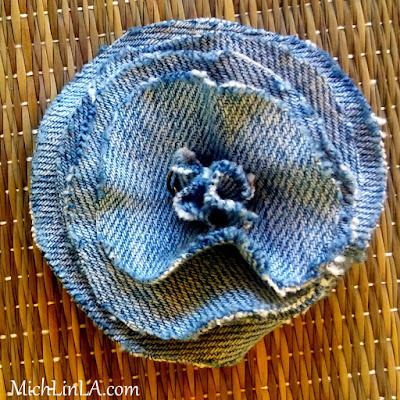 I can see making an entire bouquet of perky denim flowers. Great tutorial as always! 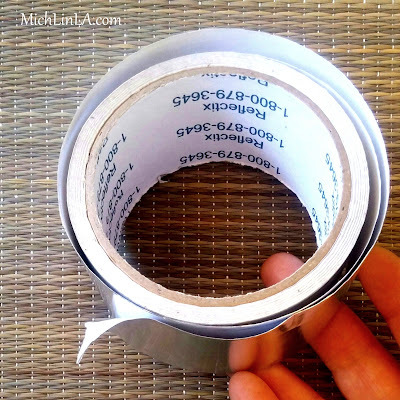 I wonder if that aluminum duct tape could be used instead of an underwire bra, lol. Ha! Blushing! Luanne, you are silly but I love ya! Genius as always and darned if those underwires aren't always popping their way out! Featuring when my party opens up tonight! This is one amazing idea. 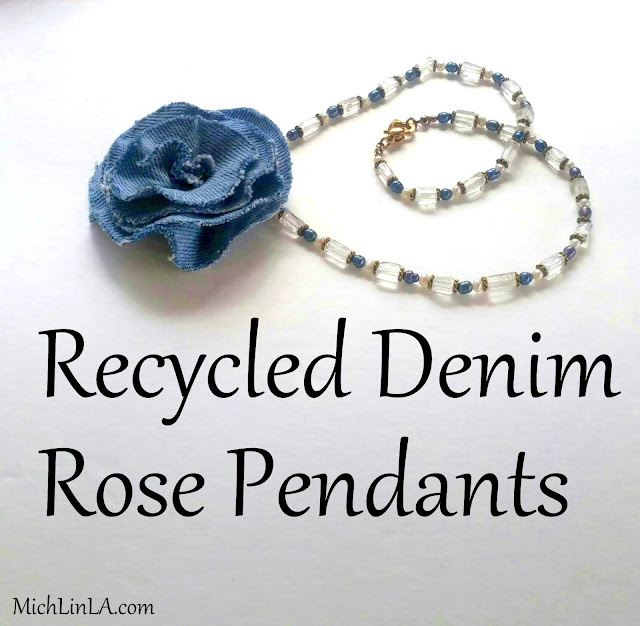 Wow Mich. Denim recycling ideas by you are always amazing! Love it Mich, and great idea with the wire to hold it up! thanks for sharing on craft schooling Sunday, great to reconnect! I love these denim roses, they are lovely and what make a great embellishment as well as a necklace. I have pinned to my denim craft board. fantastica, y la idea para hacer el colgante atrás está genial!! !